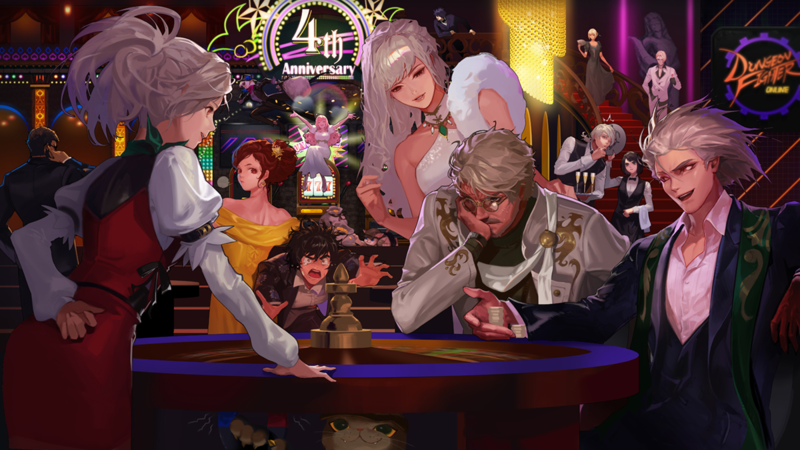 The concept of this event was inspired by the Royal Casino Dungeon. So, we prepared a set of illustrations with a casino concept. 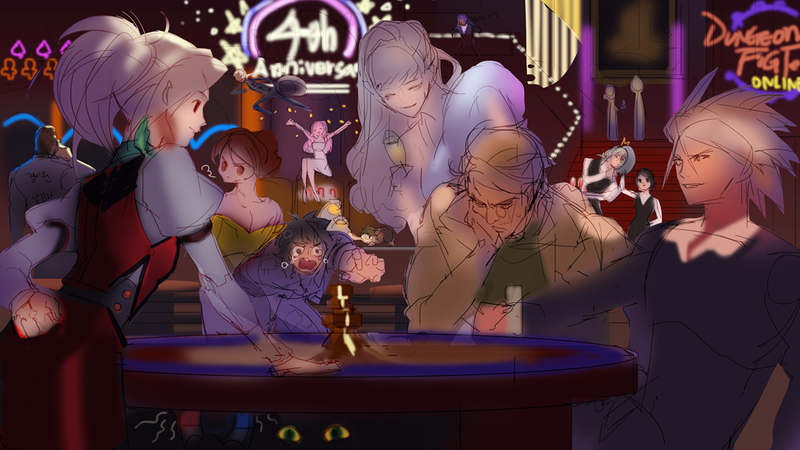 Among them, we'll introduce you to the production process of the "4th anniversary Secret Casino Illustration"
First, I imagined about adventurers playing games at a casino, and drew a rough sketch of them. 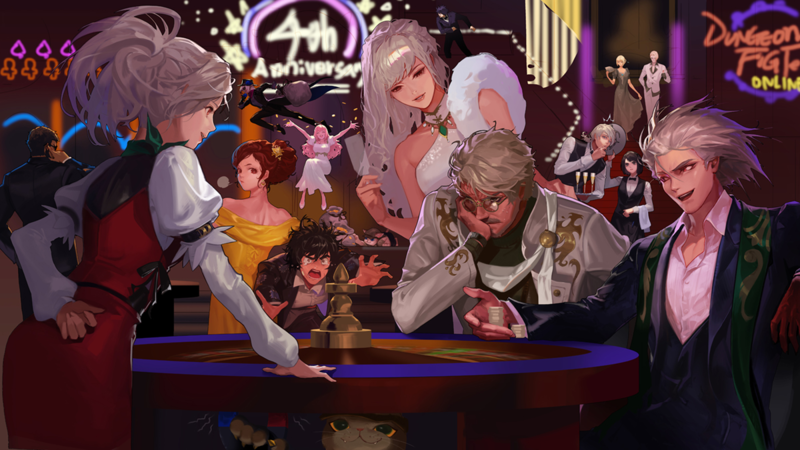 During this time, I received requests to include as many characters as possible. And these are the early sketches I came up with. In this image, you can see the Agent in a very tough spot contemplating his next play, and the Slayers observing him. Keeping "deceptive Seria" and "Pickpocketing Kisa" as the main theme, I drew the other adventurers. 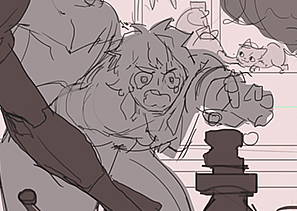 To add some fun to the illustrations, I added images of a male fighter being dragged out of the casino by a female fighter after losing all of his money, and a knight hitting the jackpot. 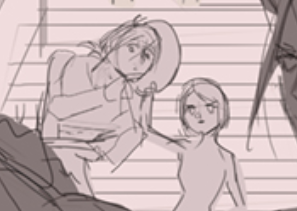 A thief and Kisa that is trying to steal the knight's money. 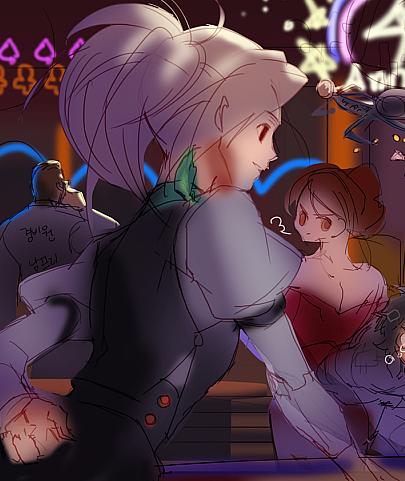 And then I added in the male priest & demonic lancer as security guards discovering the scene. In addition, you can also see the male gunner trying to watch the game, and the female priest who tells the gunner to concentrate on his work. 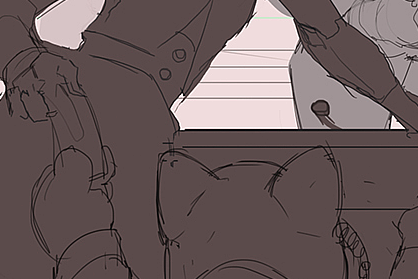 And we also added a sketch of a female gunner having a nice chat with the dark knight on the stairs. I'm sure that there will be some adventurers who are disappointed that we didn't include the male/female mage and creator. 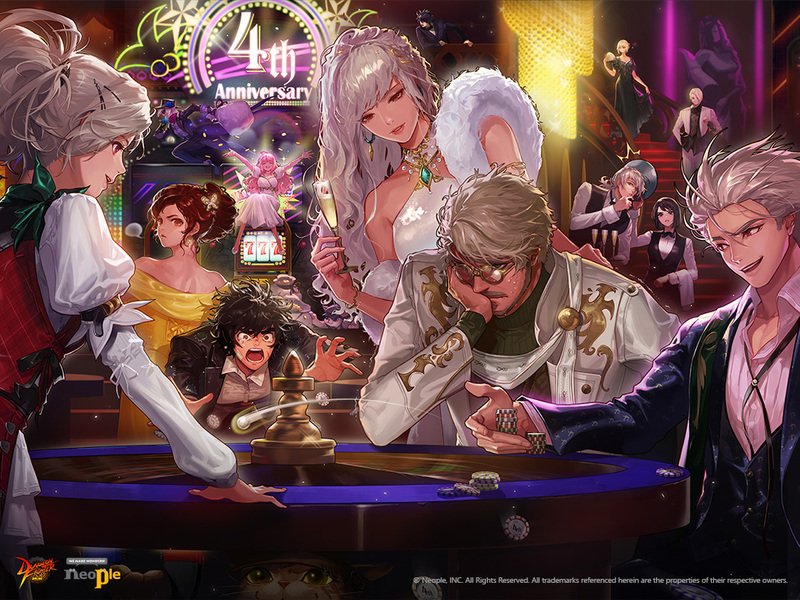 But since the background was set in a casino, there were opinions that it would be better to exclude young-looking characters such as the mage and creator. 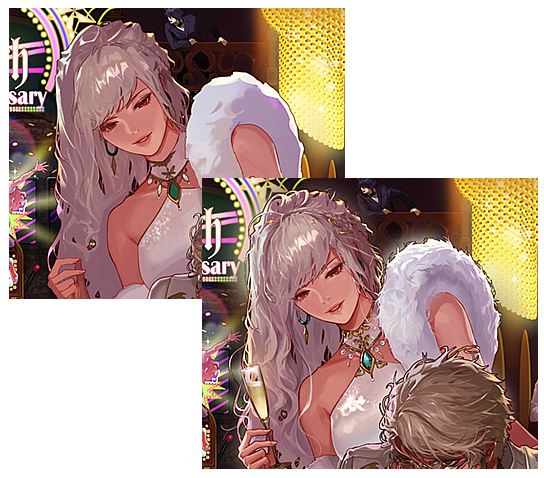 So unfortunately, they weren't able to appear in this illustration. 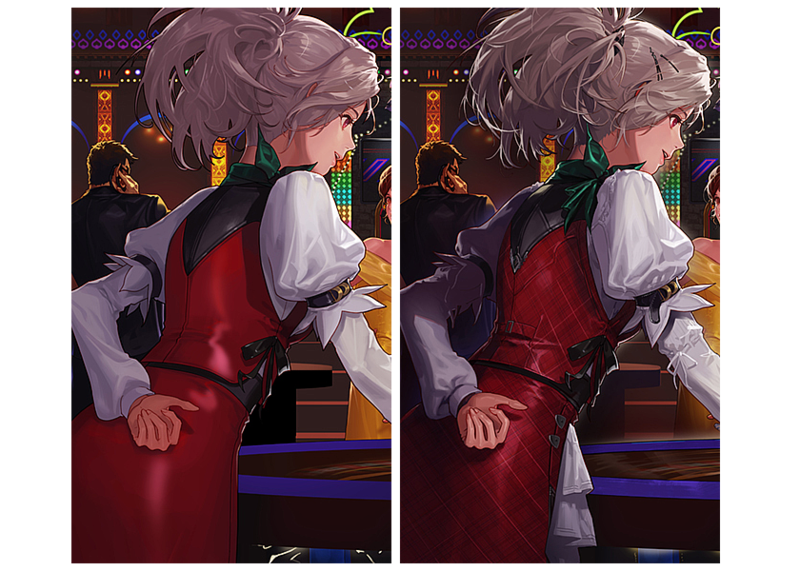 In the early version, the clothes of Seria were painted blue, but there was an opinion that she didn't look like a dealer, so we have changed it to red. And because the color of the female fighter was also red, we have changed its color to yellow. As for the background, we tried to mimic the background of the Royale Casino Dungeon. 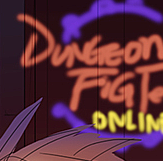 In order to create a more fancy and elegant tone, we designed the 4th-anniversary neon sign and the DFO logo to give off a club-like atmosphere. 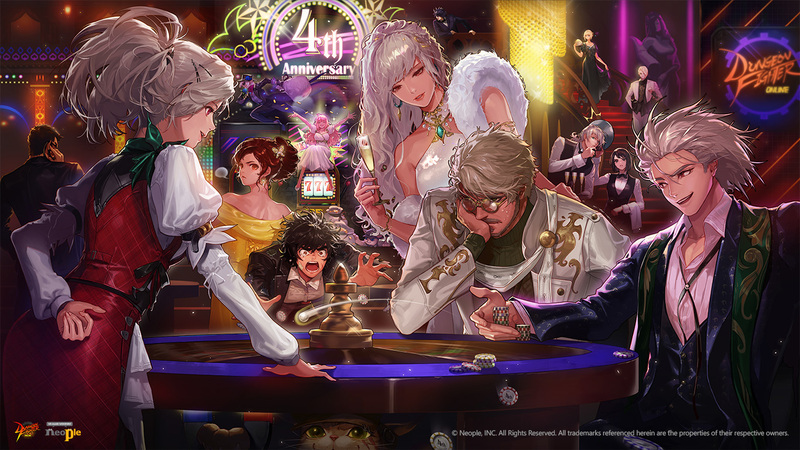 Oh, and the cat under the table was put inside the illustration with a concept that he was manipulating the roulette beads with magnets. 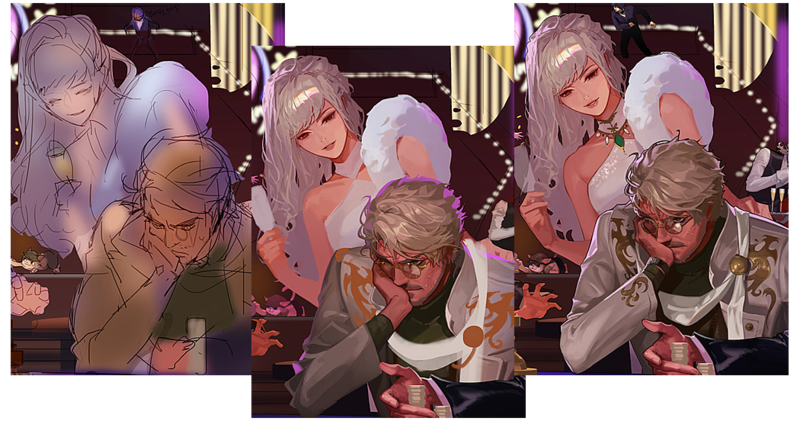 Anyway, the base coloring work is done as shown below. 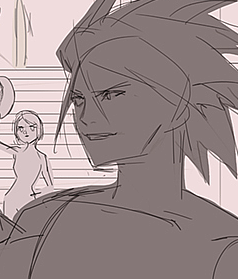 After setting the atmosphere, lets focus on adding the details while considering the character's facial expressions and behaviors. 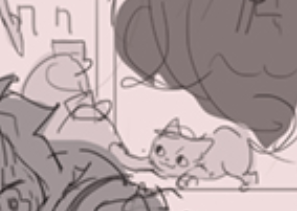 And I added some facial features for the cat under the table instead of just showing its eyes. 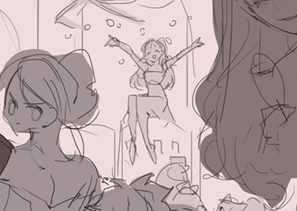 After adding some details, the illustration looks like this. 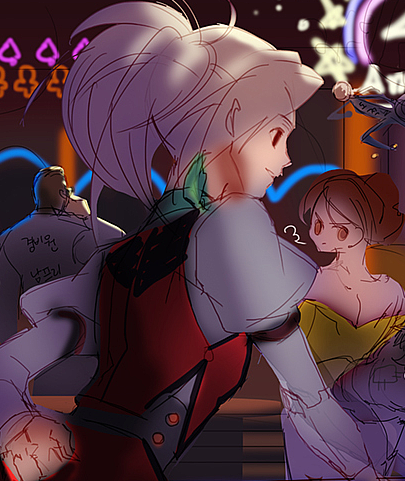 Since we are done with coloring, now it's time to work on the background. 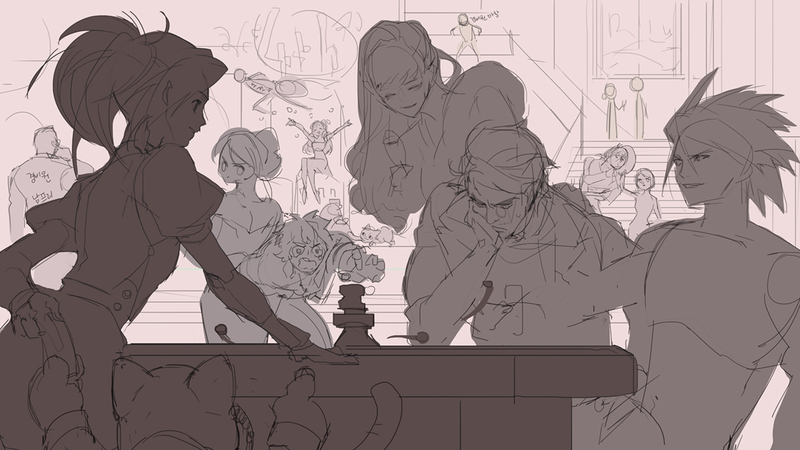 Now it's time to trace the lines of the characters. 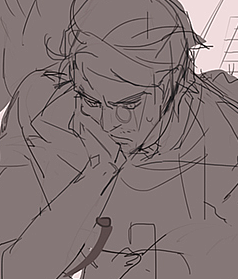 While drawing the lines, we will also re-touch on the impressions of the characters. Now it's time to work at the details. First, since Seria's clothes looked a bit dull, I added some checkered patterns to give some style. 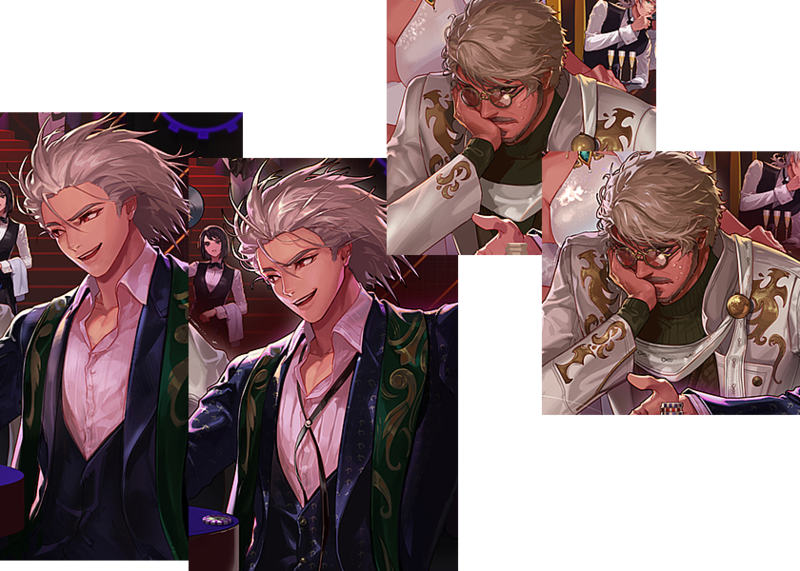 More added details on the scarf and cuffs. I added accessories to the characters for a better detail. While also adding a nice piece of necklace and a pair of bracelets to the female slayer for a fancier look. More details by adding some patterns to the slayer's clothes and giving them a tie. I have also added some more touches to the roulette game board. 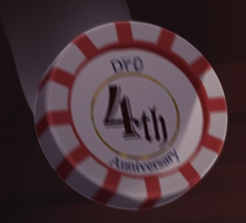 I have drawn a pile of casino chips, and added a '4th anniversary' mark into it. 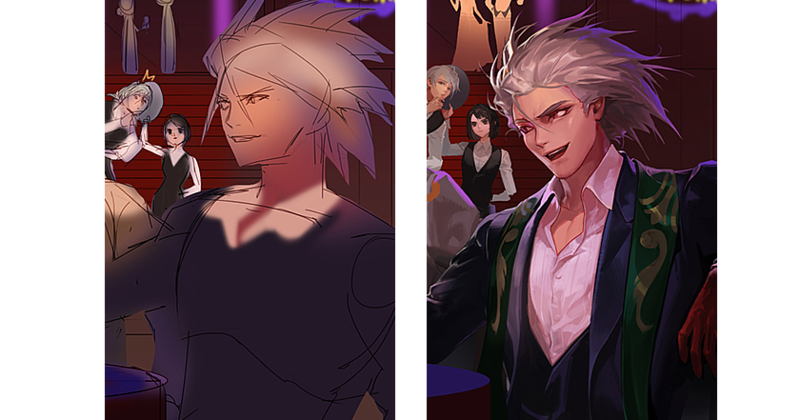 The left image is the one before adding such details. 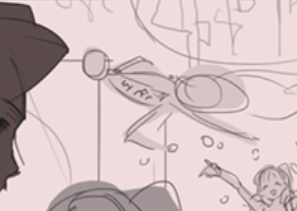 And the right one is the image after putting in some additional details. After finishing the details, we have added some dust and light smearing effects. 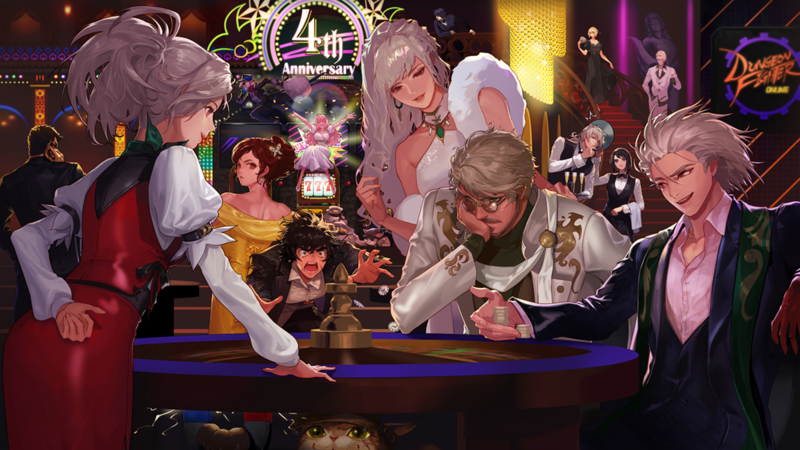 * 4th Anniversary illustration will be available as a wallpaper. You can download them below! As much as I've enjoyed, I hope that every adventurer would enjoy this 4th anniversary update as much as I did.